← This May Be Disturbing to Some Viewers! The cowards are coming out of the woodwork, exposing their appeasing hearts. While murdered satirical editorial-cartoonists in France are labeled “brats” for their very brave efforts to practice free speech! Some Americans are accusing the noble of foolishness, and excusing the guilty on the grounds that they were incited! Satire has a very long history. It has been a tool to express frustration and intimidate challengers…all without raising a fist, wielding a sword, or discharging a weapon. Words are powerful…add pictures and we all get the message! 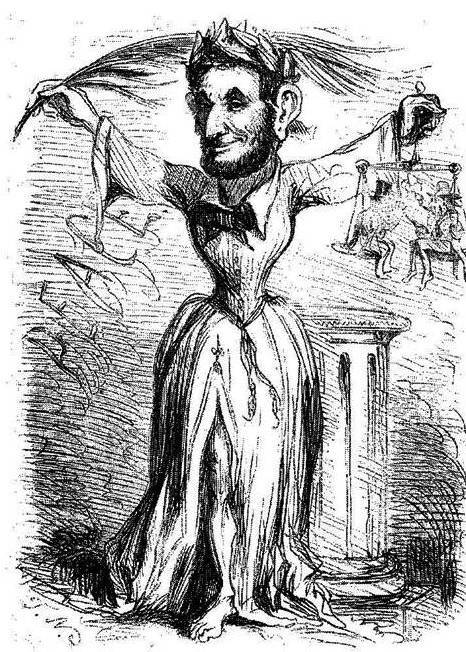 Abraham Lincoln was satirized relentlessly. His critics stopped at nothing, even mocking his brutal death. Cowardly leaders, who are willing to surrender our freedoms to terror, must be challenged. If we continue to allow them to speak for us we risk becoming servants to the most brutal. Surprisingly, the French are standing up. “Je suis Charlie” is the message they are sending to Islamists, and the world. “I am Charlie” marks their brave positions. A stance, not intent to cower in fear of possible future attacks, but standing in the open, refusing to bow to terrorism! Some doubt the current resolve of the French. For now, they are exemplifying a courage that the rest of the world should follow! This entry was posted in Uncategorized and tagged Charlie Hegmon, cowardice, freedom of speech, Je suis Charlie, satirical cartoons. Bookmark the permalink.